Romano Fenati retaliated against another Moto2 rider over the weekend by grabbing his brake lever while racing, and there’s been quite the retaliation against Fenati since: His teams dumped him, and a consumer-rights group said it reported him to an Italian prosecutor’s office to be investigated criminally, including for attempted murder. The consumer-rights group, an Italian nonprofit called Codacons, announced Monday that it reported Fenati to the local Rimini Public Prosecutor’s Office after what happened during the MotoGP San Marino Grand Prix in Italy. The formal report asked the office to investigate what happened in the Moto2 race, where Fenati hit fellow rider Stefano Manzi’s brake lever and made him “skid dangerously ... at over 200 kilometers per hour,” the Codacons statement said. It is a very serious gesture that undoubtedly leaves the field purely sports and enters the penal one - explains the Codacons - Having pressed the brake of an opponent when the bike proceeded at such a high speed, can be equivalent to deliberately endanger life of others, without counting the bad example given to millions of young people who follow motorbike races. For this reason, the Codacons presented today a statement to the Rimini Public Prosecutor asking the judiciary to assess whether the gesture of Fenati can configure any relevant criminal offenses, including that of attempted murder, and in the case proceed against him with the criminal action that will be deemed appropriate. Fenati reached for Manzi’s brake lever while the two raced for position in the second-tier Moto2 race, reacting to some earlier racing that took them both off track. 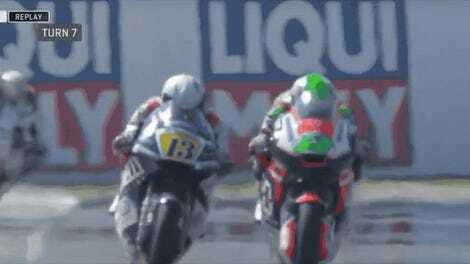 Manzi lost control of his bike and later crashed, and race officials black flagged Fenati before giving him a two-race suspension. Manzi told Italian outlet Quotidiano.net, in another rough translation from Italian, that he didn’t know how he “managed to stay upright” after Fenati hit his brake lever. 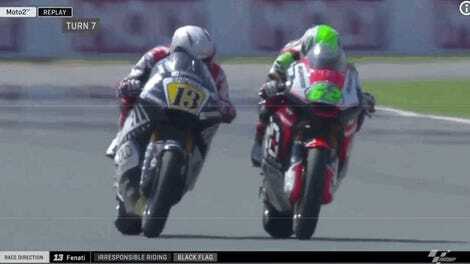 Manzi also claimed that Fenati hit his brake lever way harder than it would’ve been hit in normal race conditions. He may not have as much time to reflect as he originally thought, if this new development from Codacons gains traction.